When the dust settles after tonight’s duel between Western Conference top guns San Antonio and Oklahoma City, several significant streaks will either continue or get stopped cold. Coach Popovich’s guys own the NBA’s best record at 59-16 and have won an incredible 19 contests in a row, including last night’s home dismantling of the Golden State Warriors, 111-90. The 54-19 Thunder hold the league’s second best mark. Leading 2014 NBA MVP candidate Kevin Durant has scored at least 25 points in 38 consecutive games, second only to Michael Jordan’s 40-game streak way back in the ’86-’87 season. Also on the line this evening are OKC’s four straight W’s over their Western Conference brethren, including all three meetings this season. In addition, the Spurs have lost six straight in Oklahoma City including the playoffs. Not only do the Spurs have something to prove, but with about two weeks left in the regular season, a San Antonio victory tonight would give them a five-game cushion over the Thunder for the top slot in the West. However, with tonight’s 48 being the back half of a back-to-back and SAS’s fifth game in seven nights, it will be interesting to see if the wizened Popovich decides to limit his stars’ minutes, bearing the big playoff picture in mind, or to put the pedal to the metal in what could possibly be a preview of this year’s Western Conference Finals. The rested Thunder, winners of 6 of their last 7, last played on Sunday night against the Jazz. In their 116-96 home W over Utah, Coach Scott Brooks’ squad shot 55% from the field, 61% from 3 and 89% from the line. The always spectacular Durant had 31 points and 9 dimes in only 29 minutes of floor time. These two sides last matched up on January 22nd in San Antonio. In the 111-105 Thunder win, KD went for 36 and, playing for the injured Russell Westbrook, 3rd-year PG Reggie Jackson put up 27 points, 8 dimes and 2 steals. It was more of an offensive than a defensive battle, with both teams shooting above 50% as well as lighting it up from the 3. Tune in to TNT at 8PM ET to see if the team with both the best overall record as well as the best road record can finally take one from KD & Company. With the playoffs fast approaching, tonight’s third matchup of the year between the Nets and Bobcats carries important implications for both sides. 19th-year super-vet Kevin Garnett has missed the last nine Nets contests with back spasms and will be in street clothes again when the 33-35 Charlotte Bobcats come to Brooklyn this evening. However, during this Big Ticket-less span, the rest of coach Jason Kidd’s guys have stepped up, going 7-2 over this period. And with a victory tonight, the 34-31 Nets will have won 10 in a row at Barclays Center. Brooklyn currently sits in the 5th spot in the Eastern Conference, only 2 games behind the Bulls. The once and future Hornets franchise, in the 7th slot, trails the Nets by 2.5 games and has a 5.5 game lead over the 9th place Knickerbockers with only 14 games left to play. The first game between these two squads took place in Charlotte on November 20th, and the home team prevailed 95-91. Charlotte was led by G Kemba Walker with 31 points and 4 for 7 from downtown. Back-up center Andray Blatche came off the bench for 25 points and 7 boards. In the second 48 on February 12th in Brooklyn, the Nets hammered the Bobcats 105-89 behind a blistering third quarter in which they outscored Charlotte 35-19. On that wintry evening, Paul Pierce put up 25 points, going 9 for 11 and a perfect 5-5 from the arc in only 22 minutes of court-time. Brooklyn last played on St. Patrick’s, besting the visiting Suns 108-95. All five of the Nets starters scored in double figures with PG Deron Williams leading the charge with 28 points on 11-13 shooting. Charlotte had won four in a row before dropping a home game to Atlanta 97-83 on Monday. To serve the Bobcats another loss, Brooklyn will have to contain Charlotte big man Al Jefferson, who leads their team in scoring and rebounding at 21.3 and 10.4 respectively. With no KG and Brook Lopez for the season, look for the Bobcats to stress Jefferson’s wily inside power game tonight. Ryan Ruocco and I will be back in the booth for another big game at Barclays Center. Tune in to YES Network at 7:30PM ET to see if the Nets will continue their winning ways in Brooklyn. When the 2013-14 season kicked off in autumn, many orbiting the hoopshere predicted that the Brooklyn Nets would battle the Miami Heat for the top spot in the Eastern Conference. After all, adding the Big Ticket, The Truth, AK-47 and JET to the formidable triumvirate of Lopez, Johnson and Williams would surely get the Nets somewhere close to the East’s pole position. Whispers of the first NBA Championship in Metro NY since 1973 were heard on subway platforms from Brooklyn Heights to Bensonhurst. However, the realities of age, injuries, team chemistry and new roles took their collective toll on first-year coach Jason Kidd’s squad. Brooklyn stumbled out of the gate, going 5-14 in the first quarter of the season. But with the new year came a revitalized and more tenacious group. Despite losing All-Star center Lopez for the season, Brooklyn is 22-9 in 2014, better than every other team in the East during this 2.5 month period. And with 75% of the schedule behind them, the Nets have climbed above .500 to 32-30, good for a solid 6th seed. Though nowhere near where they thought they’d be at this juncture, Brooklyn is starting to resemble a scary, poised opponent. Tonight the Nets and Heat will battle in the third of four 48’s this season. Brooklyn bested LeBron and friends in the prior two meetings, once in the Orange State and once in the Empire State. At 44-17 Miami is second in the East, 1.5 games behind Indiana. On Monday night at home they ended a 3-game losing streak, topping the upstart Wizards 99-90. MVP James led his team with 23 points, 8 dimes, 7 boards and 3 steals. With 21 games remaining in the regular season, Miami has time to catch the Pacers and will try to make a statement on their homecourt. The Heat have the league’s second-best home mark at 25-4, while Brooklyn is just 12-19 away from Barclays this season. 19th-year veteran Garnett has missed the past six games for the Nets and will also miss tonight’s big test. Andrei Kirilenko was ruled out due to a sprained right ankle and will miss his second straight game. Tune in to the YES Network at 7PM ET to see if the Nets can be the rare team to win the season series against this Miami juggernaut. Ian Eagle and I will be back in the booth, and Sarah Kustok will join us from the sidelines! The Oklahoma City Thunder, owners of the best record in the league at 37-10, come to Brooklyn tonight for their only outer-borough appearance of the year. The Thunder’s newly anointed ‘Slim Reaper’ Kevin Durant is on an amazing streak even for him. The one-time Texas Longhorn has scored over 30 points in each of the last 12 contests, something not done since T-Mac went 14 games over 30 in the ’02-’03 campaign. KD is averaging 38 ppg over this span of a dozen 48s. Without PG Russell Westbrook, Durant’s sizzling play has led OKC to a nine-game winning streak, longest in the Association. Coach Scott Brooks’ guys went to South Beach on Wednesday night to play the defending champs and came away with a 112-95 W after trailing early by 18 points. 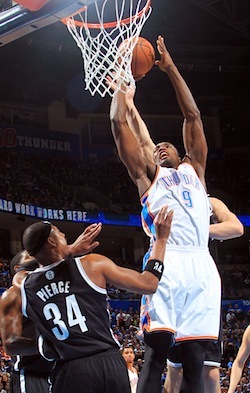 PF Serge Ibaka poured in 20 points and the second-oldest player in the league, Derek Fisher, had a season-best 15 points in the Sunshine State victory. Even with the Thunder’s spectacular play of late, no team in the NBA has less than 3 losses in January except for the Brooklyn Nets. The 20-23 Nets are 10-2 this month with both defeats administered by the Toronto Raptors. In fact, Brooklyn last played on Monday night when Toronto ended their 5-game winning streak with a 104-103 home loss. Paul Pierce shot for a season-high 33 points, but missed a tough 3-bomb at the buzzer. These two sides matched up on January 2nd in Oklahoma City with Brooklyn earning their best win of the season to that point. The Nets’ team D kept KD from going off, holding him to only 24 points. In fact, since Xmas, this was one of only 2 occasions that the NBA scoring leader failed to break 30. Not only did coach Jason Kidd’s team play tough D, but they came back from a 10-point deficit in the final seven minutes and won 95-93 when Joe Johnson’s jumper at the buzzer connected. In addition, PG Deron Williams scored a season-high 29 points in the Sooner State upset. Tune in to YES Network at 8PM ET to see if Brooklyn can come away with the win against an OKC team that has yet to lose on the road to an Eastern Conference foe.